NEET is the most sought after medical entrance test conducted at the national level. The test scores are used to seek admission in the premier medical and dental colleges of the country. From 2019 onwards, the test is to be conducted by National Testing Agency (NTA) instead of CBSE for admission to MBBS and BDS courses in the colleges approved by the Medical Council of India or the Dental Council of India (for dental colleges). 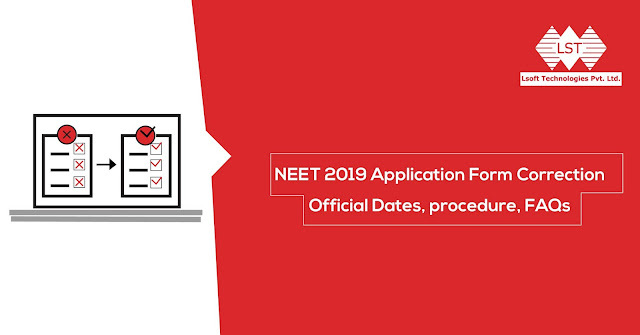 NEET 2019 is scheduled to be conducted in a single window on May 5, 2019. The exam will be conducted over a 3-hour span from 2 PM to 5 PM. The registration process for the NEET 2019 exam is over and the last date to register for the exam was December 7, 2018. In order to make changes in the registration or application form, candidates need to visit the NTA NEET website- ntaneet.nic.in. As one reaches the official website, the left side of the page will have an option of ‘One Time Correction’. Candidates are required to click on this option and go to their application form. To do the same, candidates need to login to their account using the login ID or application number and Password that they received at the time of registration. After the successful login, candidates should verify all the details that they filled in the application form. In order to make changes in any of the details, edit the specific detail with the correct information and then click on ‘Save’ option. In this way, the new information will be saved and used for future references. While verifying the details, candidates should thoroughly check the entire data filled in NEET 2019 application form. Candidates are advised to check the spellings of their name, their father’s name, and other personal information. In addition to this, candidates should also check their photo and signatures uploaded at the time of registration. In case of any error, candidates should make the requisite changes or report the officials if required. Other details such as date of birth, the medium of instruction, education qualifications etc. should also be cross-checked and verified. NTA is a self-sustained body that carries out smooth conduct of various national-level entrance examinations and ensures fair, efficient and standardized conduct of examination in order to assess the competency of candidates for their admission to the prestigious higher education colleges and institutions of the country.